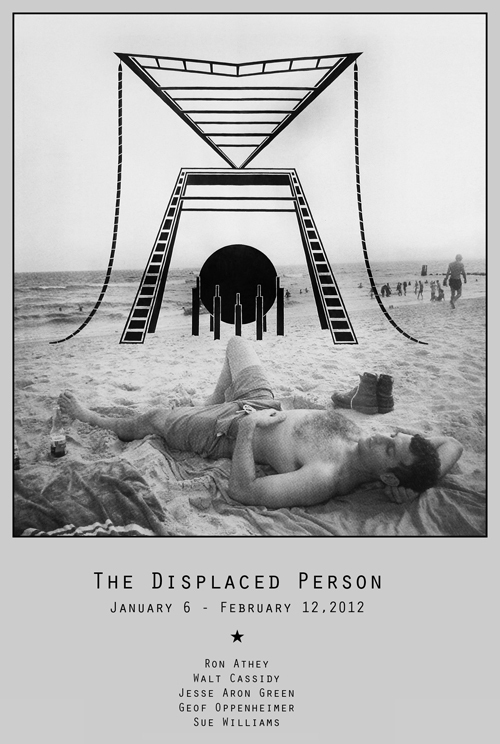 INVISIBLE-EXPORTS is pleased to present The Displaced Person, a group exhibition featuring works by Ron Athey, Walt Cassidy, Jesse Aron Green, Geof Oppenheimer and Sue Williams. Public space is palimpsest, an accidental archive of imperious elements and refugee cultures, competing claims, misfits, dissidents, legacies and outcasts, all cast together and called, simultaneously, forward. But what goes by the name of renewal, in city life and politics, in arts and culture, is often just a flattening, a sorting, sometimes even an obliteration. The work gathered here, by five artists exploring the libidinous zone between public and intimate, sanctioned and condemned, suggests instead that displacement, exclusion, and alienation, as much as they are symptoms of social failure, can return as civic virtues. In fact, they must. Ron Athey (b. 1961) is a London based performance artist whose iconoclastic work reconsiders preconceived notions of masculinity, sexuality, religion and the anxiety surrounding the AIDS crisis. Athey’s work and performances have been staged and exhibited internationally including at MOCA Los Angeles, the Kampnagel Theater, Germany, and Western Projects, among others. His upcoming monograph, “Pleading in the Blood: The Art of Ron Athey”, will be published by the Live Art Development Agency and the MIT Press in 2012. Walt Cassidy (b. 1972) is a New York based artist whose latest work examines the narratives of alternate belief systems, the interiority of personal history as well as social and civic dislocation and identity. His work has been exhibited at MASS MOCA, Paul Kasmin Gallery, 303 Gallery, The Torrance Museum of Art, and Deitch Projects, among others. Jesse Aron Green (b. 1979) is a nomadic artist whose investigative work merges multi-media installations with research-based conceptual foundations. His work has exhibited at the Williams College Museum of Art, the Tate Modern, London, and the Whitney Museum of American Art, among others. Geof Oppenheimer (b. 1973) is a Chicago based artist working with diverse media, who takes the formal manifestation of civic value as his subject, interrogating the ways in which political and social structures are encoded in images and objects. It is a practice situated at the intersection of art and politics, but in such a way that neither art nor politics is reducible to the other term. He has exhibited at The Project, New York, Aspen Art Museum, LAX ART, PS1 Contemporary Arts Center, The Contemporary Museum, Baltimore, and SITE Santa Fe, among others. Sue Williams (b. 1954) is an American painter, whose works echoed and argued with the dominant feminist aesthetic, with a frank and caustic eye toward gender politics and the sanctuary of the body. Her work has been exhibited internationally at institutions that include the Museum of Modern Art, New York, Art Institute of Chicago, IL, Museum of Contemporary Art, Los Angeles, Vancouver Art Gallery, Dallas Museum of Art, Dallas, Texas, Vancouver Canada, P.S. 1 Contemporary At Center, Long Island City, NY, Kunst Werke Berlin Germany, Kunsthaus Zurich, Switzerlan, Museum voor Moderne Kunst Arnhem, Netherlands, Palais de Tokyo, Paris, France, SITE Santa Fe, Santa Fe, New Mexico. She has had solo exhibitions at the Carpenter Center at Harvard University, Cambridge, Massachusetts; IVAM, Valencia, Spain; Vienna Secession, Vienna, Austria; and Centre d’Art Contemporain, Geneva, Switzerland; among others.